The Blue cruise is especially made for all kinds of people wishing to enjoy the beautiful waters of the Mediterranean spending time with friends and family or just enjoying meeting people of other nationalities, a great way of meeting new friends. In general Standard Gulets provide your own private shower and toilet. Each cabin is usually Twin, Double or Triple. Departure dates in cabin rentals are carefully selected by our company to guaranteed departures. 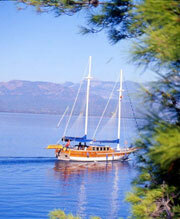 Cabin Charters starts and ends from Bodrum, Marmaris, Fethiye, Gocek and Olympos and Rhodes can be a option for you. You decide and let us know your options and leave it all to us to work on your itinerary. From the link above you will find information about our Boat cruise options.